Well, it turns out it is! We at InsuretheGap have been made privy to some of the most shocking revelations since the great Tooth Fairy scandal of 1998. In a remarkable act of defiance, a senior elf turned to us to help expose his findings and ‘get the truth out there’, claiming that the public ‘had a right to know’. In what our source has described as a ‘heinously expensive endeavour’, Santa’s bill to get the job done in the UK in just five hours tops £610,074,041. That’s more than the daily running cost of Amazon, Google (Alphabet) and Facebook combined! Moreover, contrary to the popular belief, we’ve discovered that Santa employs a crack team of van-driving elves (828,206 to be exact) to deliver his presents rather than relying on flying reindeer. Not even Royal Mail, DHL and FedEx combined can match that! Working between the hours of 12am and 5am, each elf is assigned a van and a delivery area averaging just 0.29km², delivering presents to each and every household. 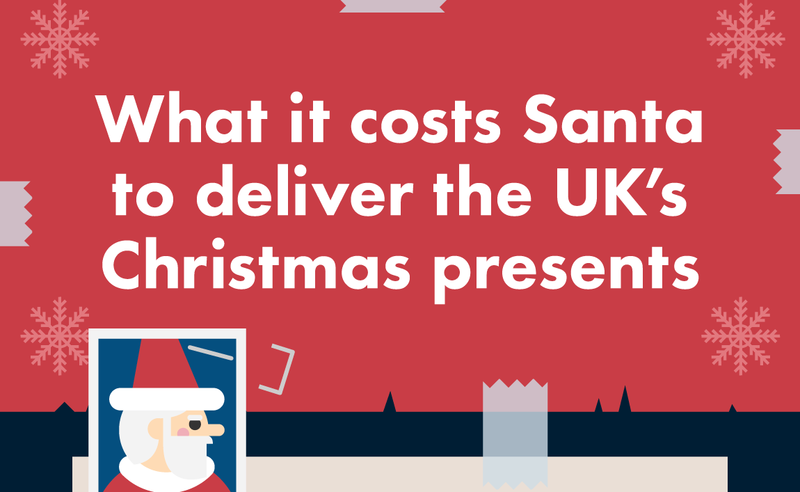 And, despite being able to carry over 300 presents per van, most are carrying as little as 78 in order to hit their delivery target of one present being delivered every four minutes within the five hour window. Despite each van’s relatively small delivery zone, such a huge volume of vans hitting the road creates one hefty fuel bill – totalling a mammoth £29,941,449.87 based on current diesel prices. Let’s hope he has a loyalty card!